Well, I dragged my wife and step-son (19 years old) to the show and they enjoyed it. Met with some other old time YES heads prior to the show and afterwards. There was general agreement that the two new songs, Children of Light and Open Your Eyes lacked the complexity and intensity of the older material. Otherwise the show was excellent. The setting in the Temple Buell theater was intimate with great sound quality. We were about 15 rows back in the center, perfect seats. A few folks talking during the quiet parts, but not as bad as usual for concerts. "Leaves" and "RSOG" were highlights for me personally. Steve was particularly animated on this night. Chris up to his usual antics. Jon's voice was in good form and did not seem too effected by the altitude, hitting the high notes on Heart of the Sunrise. Igor did a decent job. Sherwood added some harmony to the vocal mix, but otherwise seemed to be superflous. He could be dropped and it wouldn't hurt the band's performance. Seeing Yes in the 3rd row Chris side at this beautiful small venue was the ultimate treat. This was the first time we got to see Billy and Ivan and OYE had just been released so I wasn't very familiar with it. I was super excited to have heard the KTA music and was hoping to hear them in that vain and they really were. They were very tight and looked to be enjoying the small venue tour. They were so on that I actually enjoyed Rhythm of Love. I'm not a huge Rabin fan but they put just enough twist on it to make it fit. Hearing America completely blew me away and Steve was awesome. He was doing his small jumping. Children of the Light was great and Jon mentioned something about hearing something sad about some children in Denver on the news and dedicated the song to them. When they started into TRSOG I was floored. I couldn't believe they were actually playing it. Jon was looking at me and could see the utter glee written all over my face. I waved and thanked him and waved back and smiled as if to say "how bout that one pal, like that?". What a mix and what a show. This was also the best Roundabout I had ever heard. This is not one of my favorites but by this time it didn't matter what they did. They put a definitive twist and slant on all the three encores to make them different enough to stand out. I walked out of that show ecstatic. I just returned from the concert at Temple Buell Theatre in Denver. The show was unbelievable! I saw the tour in Minneapolis on 11/18 and thought the show there was great, but tonight the band was really ON! 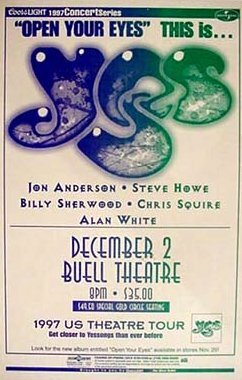 Steve was more into playing than Ive ever seen him - going all the way back to the Relayer Tour. Chris was playing marvelously and it seems that the bands total energy has risen now to his level. EVERYONE really seemed to be enjoying themselves and really into the music. The crowd was very enthusiastic - standing for almost all of the songs, even much of Steves solos - and I mean the whole crowd too. TRSOG was absolutely heavenly - it has never sounded so good. Steve was adding lots of little nuances I dont recall from the earlier show and he was bouncing around and jumping in a sort of David Byrne-like jerkiness. His solos on TRSO were so emotional, the audience was completely awed. My impression is that the band has really come together in the last couple of weeks - they are playing really well together - loose and spontaneous in all sorts of little ways, yet very, very tight overall. The setlist is the same - Leaves of Green was back in the lineup, but sadly Soon is still missing. Steves solo set consisted of Valley of the Rocks, Clap, and Mood For A Day. Billy continues to stay pretty much out of the limelight except for the brief solos, but he does add the backing support on vocals and guitar - he does seem very much part of the band. Igor is really growing into his spot - he has the chops for sure and he is making the songs his own without being unfaithful to the original arrangements. During Long Distance Runaround, Steve got up on the platform with him for a bit. Steve was really smiling a lot tonight -even when the guitar tech forgot his small light during AYAI, Steve was smiling as the tech slipped it into place, just in time for his pedal steel solo. Jons voice does still seem husky when he speaks and during HOTS it did seem a little hoarse when he sang the lower parts - but you really couldnt tell otherwise, his singing was just magnificent!